The Bridges Curriculum: preparing physician-leaders to transform 21st century health care. Select clinical experiences and scholarly projects aligned with career goals. Learn about the career launch phase of the curriculum. See how Clinical Microsystems Clerkships embed students in interprofessional clinical teams. Advance your patient care and systems improvement skills. 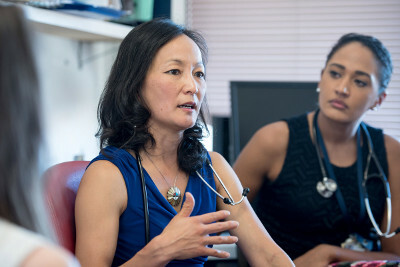 At UCSF, the purpose of medical education is to educate learners who will improve the health of our communities and alleviate suffering due to illness and disease in our patients. 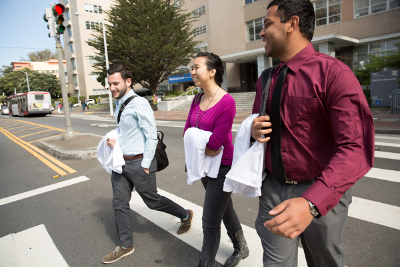 The UCSF School of Medicine Bridges Curriculum educates MD graduates to excel in the competencies needed by 21st-century physicians. 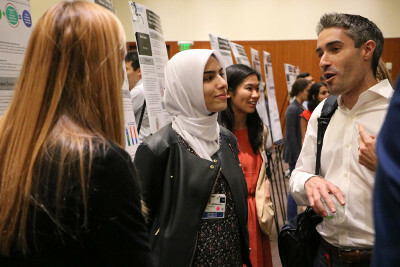 Our students work collaboratively with interprofessional teams to provide compassionate patient care while broadening their knowledge, advancing science, and seeking new ways to improve health care delivery in their communities and nationwide. The MD program objectives are defined by seven core MD competencies: patient care, medical knowledge, practice-based learning and improvement, interpersonal and communication skills, professionalism, systems-based practice, and interprofessional collaboration. Foundations 1: Students gain foundational knowledge in basic and clinical sciences while building the habits of mind of an inquiring physician, contributing to the health of patients and improving the delivery of health care. Foundations 2: During their immersion in team-based clinical settings, students advance your patient care and systems improvement skills, while revisiting core concepts in foundational science as they relate to patient care decisions. Career Launch: During this individualized phase of the curriculum, students choose clinical experiences and a scholarly project aligned with their career goals. Inquiry Curriculum: The Inquiry Curriculum is designed to help students recognize the limits of current knowledge, engage in scientific discovery, and approach health care problems through various lenses from the six domains of science. A longitudinal clinical skills curriculum, the Clinical Microsystems Clerkship (CMC): Students learn how to help patients navigate a complex health care system while also improving the health of populations and effectiveness of health care systems from the beginning of their training in Foundations 1. Close mentorship and a personalized advising system: A system to support the student's entry into the profession of medicine. A flexible learning environment: Integrate active classroom sessions enabled by online learning tools. 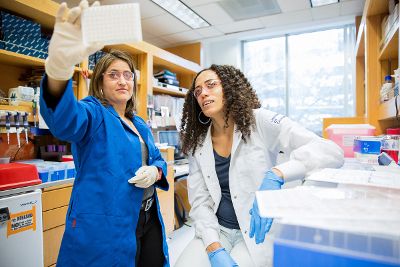 Dedicated time to engage in scholarly projects: Conduct scholarship in one of the core domains of science instrumental to solving today's health care challenges. Opportunities to individualize clinical and scientific learning to support career goals.